Dental crowns are used to completely cover a tooth that has a deep cavity, to preserve the health of the tooth. 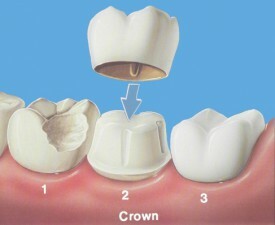 Crowns are specifically molded for your tooth, and can be shaped if your bite pattern changes. Like bridges, our crowns are made from either metal or porcelain.